Custom designed infeed for proper material flow. 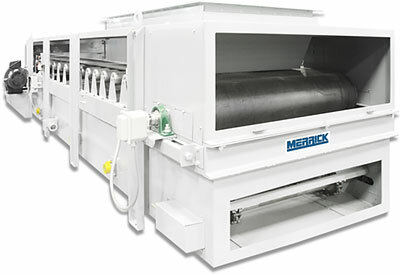 Totally enclosed, dust confining with quick removal access panels on all sides of feeder. Crowned head and tail pulleys to aid in belt tracking. Heavy duty pillow block bearings. 4” diameter flat, steel carrying idlers with sealed for life bearings. Belt cleaners at head end and return side of the belt. Two position belt misalignment switches. Tail pulley mounted speed sensor for accurate speed sensing. Doubles as a zero speed switch. Top mounted speed reducer with variable speed AC or DC motor.